In HEIR TO THE PHARAOH, ancient Egypt is going to the dogs - or maybe to the cats? Displeased by his children, the Pharaoh favours his pets instead. He has decided to alter the lines of succession and will hand over his entire kingdom either to the feline goddess Bast or to the canine god Anubis. But which one? You and your opponent play as Bast vs. Anubis, each one vying for the Pharaoh's affection - and for his throne! Impress the Pharaoh by digging your mighty paws into the sand! Bid for the favour of the gods and summon Animal Magic to win the Pharaoh to your cause! Build a mighty pyramid! Construct majestic Shrines, Sun Temples, and Obelisks! Align your monuments to one another - and towards the Pyramid - to score favour from on high! 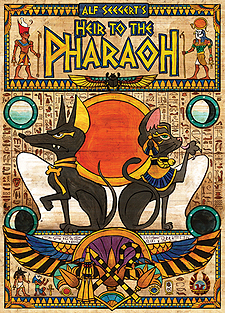 The player who claws his (or her) way to victory will be the new top dog - or fat cat - and become HEIR TO THE PHARAOH! Will the favour of the Dog Star shine down on you?Will the windswept sands of Egypt become your royal litterboxes? Play HEIR TO THE PHARAOH and find out!